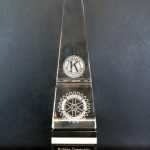 The basic criteria for selection: The Tri-Citian of the Year exemplifies the highest standards of community service, leadership and voluntary contribution of selfless acts to positively impact community development, economic growth and the overall well-being of mankind. The foremost criteria for the nomination should showcase the candidate’s demonstration for public or volunteer service, for which no monetary compensation is received. IMPORTANT NOTE: The Nomination and Selection Committees will base their decisions upon the facts presented on the pages of this form – they will not, themselves, “look up” the nominee’s history for information that might qualify him or her for candidacy. Therefore, be as thorough as possible – including all available data which will support this nomination. ATTACHED TESTIMONIALS AND SUPPORTING LETTERS ARE NOT NECESSARY AND WILL NOT BE CONSIDERED FOR THE SELECTION, THEY WILL BE USED FOR THEIR RECIPIENT’S INTRODUCTION AND GIVEN TO THE RECIPIENT. Nominations should be limited to the Four Pages of this form.